There was a person called "Miyazaki Yuzen" near Chionin in Kyoto in 1687 (the middle of Edo era). He was a painter of a fan. His works made such a great stir that he became to see the light as a designer of dyeing goods later. Kyoto prospered as a producing center of dyeing as its dyeing technique developed. Kyoto fostered its traditional skills for a long time and established its position as a place of production of dyeing by a combination of the tradition and its present dyeing techniques. ▲ From 1902 (Meiji 35), the process of dyeing called "Kamogawa Yuzen Nagashi" which is a process to remove glue fixing dye from textiles finished dyeing in Kamogawa river started. 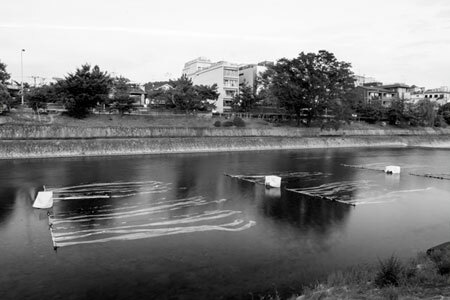 However, "Kamogawa Yuzen Nagashi" was abolished because of law enforcement of prevention of water contamination.